Qantas has doubled its annual underlying pre-tax profit to AUD552 million on the back of the strongest performance in three years of its flying divisions. In the face of increased competition, the carrier has maintained a positive outlook – with further details emerging of its future strategy. But publicly the carrier’s position is shaky as it responds to claims of a takeover bid and faces heavy resistance from unions unwilling to accept that Qantas’ storied international operations must change, as outlined last week, if jobs are on the line. Qantas mainline domestic and international operations contributed a net AUD228 million (USD238 million; up 240% from AUD67 million in FY2010) to the group’s AUD644 million (USD673 million) underlying EBIT. CEO Alan Joyce reported the international division lost AUD216 million (USD230 million), putting the mainline domestic division’s profit at AUD444 million (USD472 million) – a staggering figure for a country with a population of 22 million. Yield across the group increased 6% to 10.94 cents per revenue-kilometre, with international yields increasing by 8% and domestic yields 3%. Once again no dividend was declared, a trend unlikely to change soon. Jetstar’s profit, which has occurred every year since its launch, increased 38% to AUD169 million (USD177 million) year-on-year following 19% capacity growth with 14% passenger growth, indicating a small drop in load factors. Ancillary revenue per passenger increased to AUD24.10 (USD25.19) from AUD22.30 (USD23.31) and unit costs decreased 2%, or 3% adjusted when considering increased sector length and natural disasters. Collectivity the two passenger flying divisions, Qantas and Jetstar, contributed a greater underlying EBIT – AUD397 million (USD415 million) – than the frequent flyer division for the first time in three years. The profitable frequent flyer division was not far behind, contributing AUD342 (USD358 million) million to the underlying EBIT, a 4% increase from FY2010 when the division’s AUD328 million (USD343 million) profit surpassed the AUD198 million (USD207 million) profit from Qantas and Jetstar combined. In FY2009 Qantas and Jetstar posted a combined AUD111 million (USD116 million) profit while frequent flyer posted AUD226 million (USD236 million). The group incurred an AUD224 million (USD234 million) hit from lost revenues and customer care costs as a result of the earthquake in Christchurch, Queensland floods and cyclones, earthquake and tsunami in Japan, and ash from the Chilean volcano. 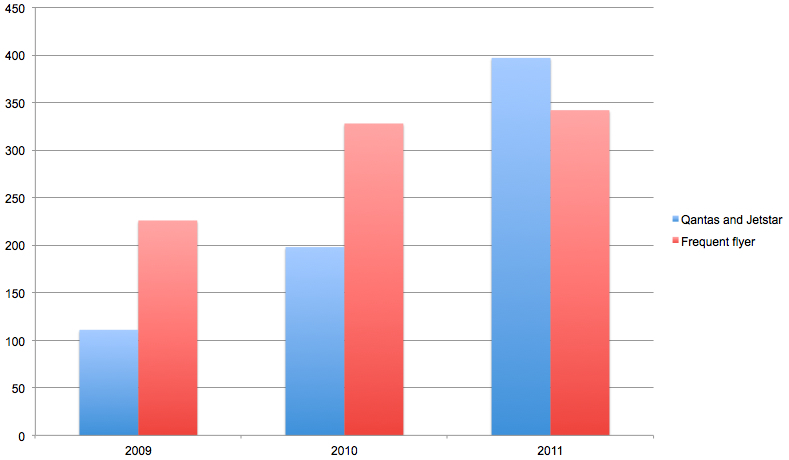 International flights were affected more at Jetstar than Qantas while domestic flights were affected more at Qantas than Jetstar. Qantas reached an AUD95 million (USD99 million) settlement with Rolls-Royce for the uncontained Trent 900 engine failure last November on an A380 operating as Qantas flight 32 from Singapore to Sydney. Qantas Freight saw a 48% year-on-year underlying EBIT profit increase to AUD62 million as yields increased 8% and capacity increased 3.7% with the addition of a B767 freighter and Qantas marketing belly capacity in Jetstar Asia aircraft. Qantas for 1HFY12 will grow mainline capacity 3.6% and 19% for Jetstar – its eighth successive year of double-digit growth – although the majority of Jetstar’s growth will be in the Asian region. Out of Australia Jetstar will grow its domestic capacity by 13% and internationally 11%. 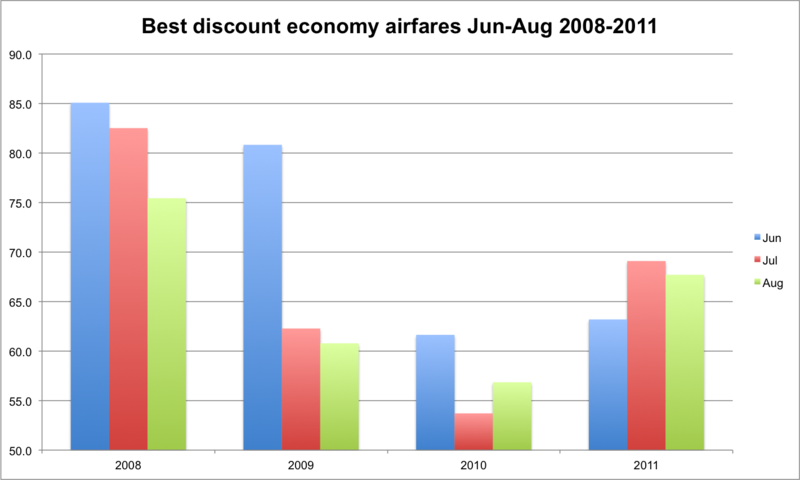 The new growth rates follow Qantas’ Jun-2011 announcement it would reduce overall domestic growth for 2011/2012 from 8.0% to 5.5%. Globally airlines are under pressure to watch capacity as fuel prices and weakening consumer confidence could decrease overall demand. 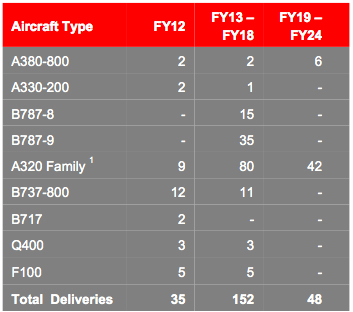 In FY12 the group plans to take delivery of 35 aircraft: 2 A380s, 2 A330-200s, 9 A320s, 12 B737-800s, 2 B717s, 3 Q400s, and 5 F100s. This excludes A320s for Jetstar Japan and Jetstar Pacific. The end of FY11 saw competitor Virgin Australia’s biggest foray yet into the corporate market with the launch of widebody A330 services with business class on the trunk route between Sydney and Perth, giving Qantas its first domestic business class competition since Ansett exited the market in Sep-2001. Virgin’s success will become evident over the next few financial years, but for FY11 Qantas saw a 19% increase in corporate revenue. Despite Virgin stating it plans to enhance its A330 product, Qantas sees no urgency to respond. Virgin’s initial A330 product has business class seats, similar to the product on Qantas’ domestic aircraft, which Qantas responded to by deploying international aircraft with lie-flat beds. Virgin is expected to fit lie-flat beds to its A330 fleet, planned to grow to four during FY12. “Lie-flat beds [on] Melbourne-Sydney perhaps doesn’t make sense, but certainly on the west coast there is a market for that. Which vehicle we choose to use really will depend on optimal use of the aircraft across the different brands and options we have,” Mr Strambi said. Qantas will be especially inclined to deploy aircraft with a lie-flat product on overnight Perth flights. While Qantas is taking a cautious view to Virgin’s A330 product intention, it is considering how it can respond if necessary. Not ruled out are deploying further B747s to Perth by holding back some or all four of the B747s due for retirement next March when the Hong Kong-London and Bangkok-London routes they serve are ended. While the B747’s economics and fuel consumption are no match for an A330, which Qantas primarily uses, they provide Qantas a quick response mechanism, and potentially more affordable in the short/medium-term than retrofitting other aircraft. The international A330s Qantas has deployed largely in response to Virgin may be needed back on the international network, such as the Melbourne-Hong Kong route which from Mar-2012 will switch from B747 to A330 service. Further, Qantas is banking on the market looking past seat type to take a holistic view of trans-continental service from check-in to baggage claim, which it reckons it dominates – and perhaps in that outlook embraces its much-accused product enhancement complacency, but reinforces the potential for Qantas to easily enhance its bottom line. On local reports from the previous day that oneworld member elect Malaysian Airlines (MAS) was re-considering its alliance membership after a management restructure following an equity swap with Tony Fernandes’s AirAsia, Mr Joyce disclosed Mr Fernandes, who gained a seat on the MAS board as part of the equity transaction, was heading the alliance review. A local report also suggested MAS would see Qantas’ forthcoming premium carrier, if based in Kuala Lumpur, as a direct competitor. “We’re in dialogue with Tony Fernandes and the Malaysian [Airlines] team and we’re still working through those issues with them. The feedback we’ve gotten is very positive from Tony. I think he’s been given the responsibility of reviewing the oneworld membership. His view is he’d like to continue and try to do something with Qantas and British Airways and Jetstar,” Mr Joyce said. “Rightly so with the new management structure and new management team, Tony is saying he wants to make sure that the alliance decision is the right decision. He’s very positively inclined towards Qantas and Jetstar. We continue that dialogue,” Mr Joyce said. Qantas is planning to launch an Asian-based premium carrier with an initial fleet of up to 11 A320s to target the very high-end passenger spectrum. For now that target allays union fears the carrier will be used to takeover, with a lower cost base, Qantas’ main international services. Qantas expects the carrier to create new opportunities and reverse its losses in Asia. In cannot be ruled out the premium carrier could stunt future Qantas mainline growth to Asian destinations. With Virgin Australia making clear it has no intentions in the immediate future to fly to China or India, favouring instead a one-stop service via Singapore with its pending partner Singapore Airlines, Qantas has little incentive to launch direct services when indirect services promise better returns. Qantas has pulled out from a host of Asian markets over the past decade – Korea, Malaysia and Taiwan to name a few – and more recently scaled back its presence in China, India and Japan. Last week Mr Joyce said Qantas International’s losses were primarily in Europe and Asia. China, for example, is now served only with a Sydney-Shanghai service. Passengers originating elsewhere in Australia must connect through Sydney. The existing network provides no opportunity to visit other Chinese cities on Qantas-operated flights as the carrier cannot amass the demand from Australia whereas Asian-based carriers have a larger network to pool from. Channeling premium passengers from Australian capital cities direct to a common point in Asia – as Qantas does with Singapore, and Hong Kong to a lesser extent with potential for Kuala Lumpur to join the mix – and then offering connections on the premium airline effectively gives Qantas, previously an end-of-world carrier, new network hub status. Mr Joyce referenced carriers, predominately in Europe, with a business class-only narrowbody operation, including the PrivatAir B737NG aircraft contracted by KLM, Lufthansa, and Swiss as well as British Airways’ A318 service between London City and New York, a service “performing exceptionally well from what we hear”, Mr Joyce said. Qantas’ planned carrier appears set to differentiate itself from the other carriers in the high-end space by also offering an economy product, albeit an enhanced version. Similarities can be drawn to All Nippon Airways' B737-700ER service between Tokyo and Mumbai that seats 24 in business class and 20 in a spacious 2-2 economy configuration. Also similar is United Airlines’ “p.s.” premium service that operates exclusively on the lucrative American trans-continental trunk route from New York-JFK to Los Angeles and San Francisco on a dedicated fleet of B757-200s. The 12 first and 26 business class seats are akin to an international product while the 72 economy seats are premium economy seats, which predominately offers up to five extra inches of seat pitch and laptop power at every row. “It will be very much designed for the business-purpose traveller, both for business and leisure travel – a very premium offering. We will have a higher premium mix onboard this aircraft,” group executive for customer and marketing Lesley Grant remarked of the planned operation. For comparison, 14% of seats on the Qantas A380 are business or first class while the figure for B747s ranges between 14% and 23%, and 7% for B737. While an A320 at maximum take off weight can reach Australia from Singapore and Kuala Lumpur, it would be restricted to nearby cities like Darwin and Perth, where Jetstar A320s currently fly. Ms Grant disclosed the carrier “will have the range to fly between Asia and Australia” but did not specify which Australian ports were in range. A very low-density configuration could see the operation capable of reaching Sydney and Melbourne from Singapore or Kuala Lumpur. The inconsistent product descriptions, with Mr Joyce labeling the operation “executive jet-type style” but Ms Grant referencing “leisure travel”, suggests planning is very much preliminary. Mr Joyce announced the North American market had returned to profitability, making the region a large bright spot in the loss-making international division. Last decade Los Angeles was one of Qantas’ top three routes before the 2009 entrance of V Australia and Delta, which saw yields plummet. 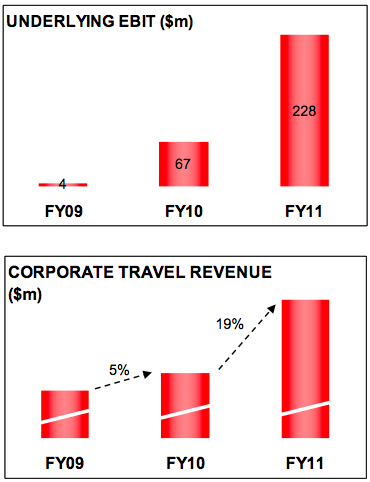 V Australia, which primarily flies to Los Angeles, was announced in Feb-2011 as being profitable. 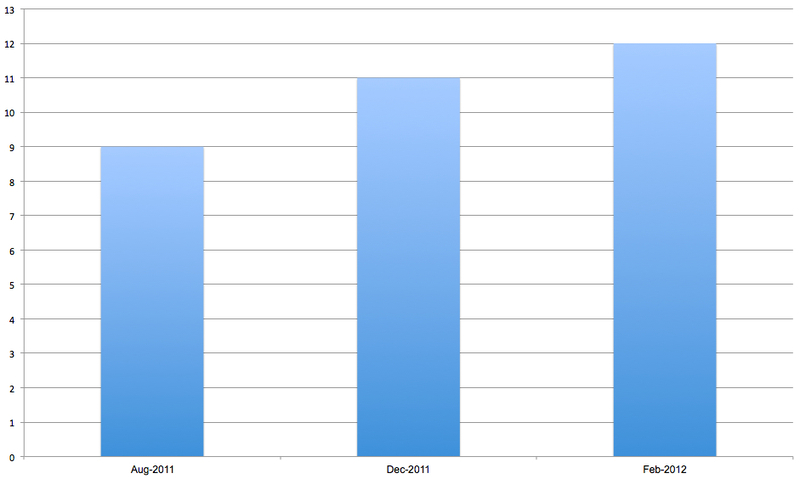 Qantas’ new route to Dallas/Fort Worth, launched in May-2011, has so far generated higher yields than to Los Angeles. The route corresponded with Qantas’ proposed joint business agreement with oneworld partner American Airlines, who is based at the Texan airport, to offer greater network connectivity and reduced fares by taking advantage of real-time fare availability. Australia’s competition watchdog proposed on 23-Aug-2011 to approve the arrangement. A final decision from Australia is expected to be followed by United States approval, at which point Qantas will plan to move the Dallas service to a daily offering – likely to occur in 2012. The Dallas service was launched at the height of seasonally unfavourable weather conditions that, combined with still-maturing flight path planning, led to operating restrictions and diversions, drawing local media attention. The route currently does not face operating restrictions and further experience with the service is expected to produce flight path planning that reduces operating restrictions and chances of diversions. The Los Angeles route could see additional capacity following an increase in its A380 fleet. By early next year there will be 12 operational A380s, up from the current nine, available for deployment. Two frames new from Airbus are due at the end of this calendar year while VH-OQA, the A380 damaged in last year’s Rolls-Royce Trent 900 accident, is planned to re-enter service in Feb-2012. Qantas is evaluating where to deploy the capacity. Trans-Pacific from Sydney, which has one of two daily flights operated by the A380, is more likely than Brisbane given Sydney’s higher premium traffic, but Qantas has not ruled out deploying the A380 elsewhere on its long-haul network. 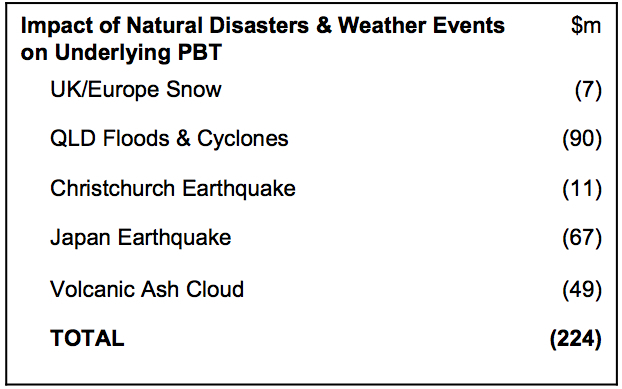 From Apr-2012 B747s are planned to serve Bangkok, Hong Kong, Johannesburg, Santiago and Tokyo, making those cities most likely to see A380 service if additional capacity is not deployed to Los Angeles. No points in America are being considered for new service. Qantas, like other carriers around the world, experienced a fall in traffic to Japan following the Mar-2011 earthquake and tsunami, and cut capacity, ending its Perth-Tokyo Narita service. While other airlines, particular in North America, continue to see weak demand, Qantas expects a rebound in just over a month. “By October we expect it to be back to normal,” Mr Joyce said, although he noted July and August and have been impacted and September is expected to be impacted as well, marginally decreasing earnings for FY12. At last week’s announcement of Qantas dropping from next year its Buenos Aires service, which it re-launched in Nov-2008 after a six year hiatus, and launching a flight to Santiago, the carrier was eager to talk up the network and connecting traffic opportunities oneworld partner LAN offers from its Santiago hub – evoking public wonder, with suspicion of mismanagement, why Qantas selected Buenos Aires over Santiago in 2008. Group executive for commercial Rob Gurney had a firm line that Argentina failed to deliver expected network and economic projections. “The decision at the time was based on an opportunity in the Argentine market. There was a view it was underserved,” he said, before explaining today’s reality: “The Argentine market itself has not grown at the same rate as the other South American markets, and that’s probably the key imperative for making the change.” The Chilean market has also overtaken Argentina in terms of market size and revenue. Air New Zealand is also seeing the potential of Brazil, as is the New Zealand government, which wants to turn the country into a hub for Asia-South America flights. For now Air New Zealand is waiting for suitable aircraft, or hoping for LAN-TAM to swing towards Star. Their final alliance decision will either leave one carrier embarrassed at launching a new route but then quickly losing hub traffic, or leave another carrier empty-handed and forcing it to ponder how long it can hold off on serving the route with the right forthcoming aircraft before its competitor makes significant inroads. The carriers may be content with the status quo since when Tiger resumed services on 12-Aug-2011, its lead-in fares could be more expensive as they had a higher base to undercut, giving Tiger higher revenue opportunities – and the same for competitors. What can change the balance is if one carrier blinks and significantly undercuts the competition, forcing retaliation and fare wars. While Qantas domestic propped up the group, not to be overlooked is the regional QantasLink operation. Mr Joyce previously summed up QantasLink as the “quiet achiever” but the network is facing increased competition. Virgin Australia has partnered with Skywest to operate a fleet of eight ATR72 turboprops by the end of 2012 and from Oct-2011 will commence services with them to Port Macquarie, Gladstone, and Canberra-Sydney, all currently served by QantasLink. Strategic Airlines entered the regional network with Brisbane-Gladstone services in Apr-2011, as well as flights targeting the resource industry. The competition benefits the market, with Qantas announcing this year a frequent flyer lounge in Gladstone after serving the Queensland city for 29 years. “Our commitment to regional Australia has never been greater,” CFO Gareth Evans said. The commitment may be great, but as the Gladstone lounge shows, Qantas will have to work harder and spend more. The overall competition threat is low with Virgin Australia having only up to 18 ATR72s, including options, on order whereas the QantasLink fleet comprises 45 turboprops with additional orders and options. He was resolute Qantas would hold its position on the restructure and keeping its costs down. “For the first time we’re standing up and saying no to the unions,” he said. While detractors have pointed to Virgin Australia giving its long-haul pilots a pay raise, Mr Joyce said even after the raise those pilots would be paid half of what Qantas pays it long-haul pilots. Outlook: Developments continuing to unfurl, but first compromise with the unions, or let time run its course? Six months ago at Qantas’ half-annual results there was some discussion surrounding the Rolls-Royce Trent 900 engine failure of three months prior, but at this briefing there was scant attention or interest. Arguably the matter was behind Qantas with the A380 fleet operational and a settlement reached with Rolls-Royce. Now union tensions are high with corresponding intense media coverage, but Qantas must now decide if it can pass over immediate resolution to ride the demands and settle for less while hoping public interest dies out, as it did with the engine failure and other matters. While there has been much discussion of disruptions, Mr Evans said it is just that. “Normally what union strategy is, is to impact the business in the marketplace first without impacting their members. So a lot of talk about the disruption but not a lot of disruptions.” While the unions are planning action in the short-term, Qantas so far expects disruptions to be minimal as the action is low-impact, with pilots making short public address announcements and engineers holding one-hour work stoppages in different ports in the afternoon, which sees light traffic. The risk of continuing to put aside a settlement is employees’ lingering resentment of management that then rubs off unfavourably on the passengers Qantas wants to see on its revitalised operations.